The biggest and most complex obstacle you will ever have to overcome is your own mind. Overcome that, and you can overcome anything! It all happened so quickly, too! The pain of those experiences compounded on one another in quick succession, knocking us down and driving the wind right out of our sails for a couple years straight. At times, we felt like we had absolutely no strength left to push onward. But, as we navigated our new reality one step at a time—facing the pain instead of distracting ourselves from it—we stumbled across morsels of strength and wisdom that we began to collect and build on. We gradually learned how to catch ourselves in negative states of emotional turmoil, so we could overcome the emotions that had once overcome us. All details aside, we pushed ourselves as hard as we could to take one tiny step every day—one journal entry, one 10-minute workout, one honest conversation, and so forth. It wasn’t easy, but the tiny steps were manageable and we gradually grew stronger. And with each passing day, we saw more beauty hidden in life’s most painful changes. You see, the most painful changes in life—even deaths—are simply endings, which are all a necessary part of living. And all endings are necessary for beauty, too—otherwise it’s impossible to appreciate someone or something, because they are unlimited. Limits illuminate beauty—they are reminders that we need to be aware of this beautiful person or situation, and appreciate this beautiful thing called life. Every ending is also a beginning, because while we have lost someone or something special, this ending, like every loss, is a moment of reinvention. Although heartbreaking, it forces us to reinvent our lives, and in this reinvention is an opportunity to experience beauty in new, unseen ways and places. And, of course, every ending is an opportunity to celebrate the beautiful, ever-changing journey we’re on, and to be grateful for what it has showed us and taught us along the way. Getting to this point of understanding—changing your perspective—again, is far from easy. But it’s honestly worth every bit of effort you can muster, no matter how many times you need to remind yourself. Because we so easily forget how important it is to face the unexpected losses and painful life changes we’re going to encounter no matter how much we try to avoid them—to face down our pain and negative thinking and leverage it to get back up and take the next step. Yes, we need to be reminded to actually get up and DO the hard things we need to do to be happy again. The things that frighten us. The things others can’t do for us. The things that make the difference between existing and living—between knowing the path and walking the path—between a life of empty promises and defeat and one filled with renewed happiness, possibility and peace. Yes, that’s a quick snippet of what Alyssa Milano had to say in the foreword to Getting Back to Happy. But, why did a famous, renowned actress and activist like her decide to write this foreword for a couple of coaches and authors like us? In life our insights are often hard won, as Alyssa points out. And, ten years ago, when Marc and I were desperately struggling after losing two loved ones back-to-back to suicide and illness, we decided to be transparent about our story, our struggles, and our depression. And we also decided to share the tiny daily steps we were taking to cope, to heal, to grow, and ultimately to get our lives back on track. We shared all of this online via Facebook, Twitter, email, and our blog, and Alyssa was one of the people who resonated with our story and followed our journey right from the get-go… because she found personal value in what we were sharing. And then, she continued to follow our work over the years that followed, primarily because we didn’t stop sharing what we were learning. As Marc and I have learned—and as you’ve probably encountered too—there’s little doubt that our most important insights come directly from our hardest challenges. But we can also take these insights and pay them forward, sharing them with others in hopes that our insights might shine a light for other people who are struggling down their own paths. The opportunity to pay forward what we’ve learned inspires us continuously in our work, whether it’s through our blog, our renowned Getting Back to Happy course and coaching, our annual Think Better Live Better conference, our books, and everything else we do. And, it’s also one of the biggest reasons we wrote our newest book, also titled Getting Back to Happy, as you know. Everything we’ve learned in the past decade of coaching and teaching others about how to build a happier life is distilled into this book. Never before have we put it all in one place like this in such an accessible way. 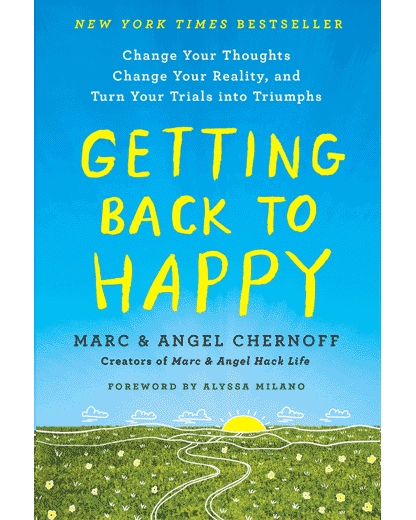 Getting Back to Happy is honestly the book we’ve wanted to write ever since we started on this journey, one that began with our personal struggle and evolved into a multifaceted coaching practice that has positively impacted the lives of thousands of amazing people, just like Alyssa. I sincerely wish I could have read it a decade ago. In many ways, it would have saved me from myself. It absolutely would have saved me from intense periods of darkness that were born primarily from my subconscious attempt to take the easy way out of the painful realities I faced. Order Getting Back to Happy and get your free bonuses right now (use the form here to submit your receipt). And of course, if there’s anything else Marc and I can do to assist you, please don’t hesitate to leave a reply below. PS. Pre-ordering the new book on or before the official release on Tuesday helps us out tremendously. We’d greatly appreciate YOUR SUPPORT today. Just ordered it. Keep up the amazing work the two of you are doing! Love that video trailer too. Inspiring! great! looking forward to the new book! years of so called evolution – now is the time for real in depth change. or ego of man !!!!! Peace, love, blessings and hugs to you both. Just bought the Audiobook to listen on my ride to/from work. Looking forward to it! Please keep us updated with any live appearances you have. Congratulations! Preordered, when can I expect my book ? I confess, I’m a lurker. And I’ve been a lurker for years. I also confess I have been following you on and off all this time. I come back to Marc and Angel when I feel like I need tools to be my best self. I take notes. I analyze. I pull out quotes. I put stuff into practice. It’s just a little bit of fine-tuning and we all need that in our lives, no matter how good we feel. Thank you, Marc and Angel (and the community of people who pop up in the comments), for being a reliable place where I know I can get all those tools, a reassuring silent guide, a gentle nudge when I need it the most. Excited to see you both on Megan today! So very happy to see you both endure success. I pre-ordered your book and received notification I get it tomorrow. Cannot wait! I start my day with your blog and it truly is inspiring. Thank you for sharing your story , and more importantly your positive realistic attitude to surviving life’s challenges. I never got the opportunity to meet my niece’s husband Josh and am not really a fan of motivational speakers or writers, but your segment today on Megyn Kelly has given me the impetus that perhaps your book will give me a different outlook on my life, even at my age. Just had my niece order it for me. Congratulations to both of you! Thanks for upbeat emails, they’ve been keeping me going. I’ve ordered the and can’t wait for it to arrive. Although I don’t know how quick the post is like from the US to the UK. Keep up the good work. You’re both stalwarts. You guys did a great job on TV this morning! Congrats on the new book. I just ordered it and am looking forward to making it a summer read. All the best. It’s my first time here and what an awesome article to begin with. The mind can truly be our biggest barrier when progressing towards the things we want. Although it’s easier said than done, we must try our best to choose the thoughts that empower us during life’s most difficult challenges. To envision new possibilities and keep moving forward – One step at a time. Also, Congratulations on the new book! Congrats to you! I’ve been following your newsletters and your blog for a long time, always finding them uplifting and inspiring. I’ve quoted your wisdom on my own blog many times, and I’m enjoying your wonderful new book. Will be reviewing it soon – and thanks for all you give to the world!